New Zealand prop Tony Woodcock is out of the Rugby World Cup after injuring a hamstring during the 47-9 win over Tonga in Newcastle on Friday. Woodcock, 34, scored his side's second try at St James' Park but limped off early in the second half and is now set to retire from international rugby. 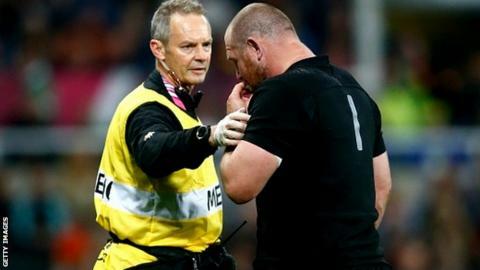 "He's been a great All Black and he deserves to go out better than this," said coach Steve Hansen. Woodcock scored a try in the final as the All Blacks won the 2011 World Cup. Friday's match against Tonga was his 118th Test appearance. Joe Moody, 27, is on his way to the UK as a replacement after being withdrawn from his Canterbury provincial team's match in New Zealand on Saturday.